Since the Solar Dynamics Observatory (SDO) began recording ≈ 1 TB of data per day, there has been an increased need to automatically extract features and events for further analysis. 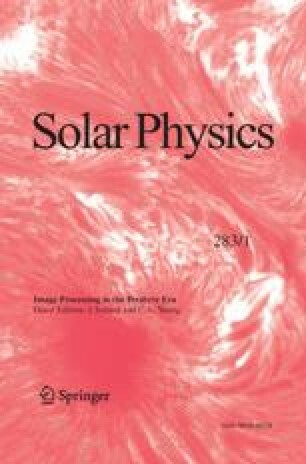 Here we compare the overall detection performance, correlations between extracted properties, and usability for feature tracking of four solar feature-detection algorithms: the Solar Monitor Active Region Tracker (SMART) detects active regions in line-of-sight magnetograms; the Automated Solar Activity Prediction code (ASAP) detects sunspots and pores in white-light continuum images; the Sunspot Tracking And Recognition Algorithm (STARA) detects sunspots in white-light continuum images; the Spatial Possibilistic Clustering Algorithm (SPoCA) automatically segments solar EUV images into active regions (AR), coronal holes (CH), and quiet Sun (QS). One month of data from the Solar and Heliospheric Observatory (SOHO)/Michelson Doppler Imager (MDI) and SOHO/Extreme Ultraviolet Imaging Telescope (EIT) instruments during 12 May – 23 June 2003 is analysed. The overall detection performance of each algorithm is benchmarked against National Oceanic and Atmospheric Administration (NOAA) and Solar Influences Data Analysis Center (SIDC) catalogues using various feature properties such as total sunspot area, which shows good agreement, and the number of features detected, which shows poor agreement. Principal Component Analysis indicates a clear distinction between photospheric properties, which are highly correlated to the first component and account for 52.86% of variability in the data set, and coronal properties, which are moderately correlated to both the first and second principal components. Finally, case studies of NOAA 10377 and 10365 are conducted to determine algorithm stability for tracking the evolution of individual features. We find that magnetic flux and total sunspot area are the best indicators of active-region emergence. Additionally, for NOAA 10365, it is shown that the onset of flaring occurs during both periods of magnetic-flux emergence and complexity development. Colak, T., Ahmed, O.W., Qahwaji, R., Higgins, P.A. : 2010, Automated solar flare prediction: is it a myth? Presentation in Seventh European Space Weather Week. http://spaceweather.inf.brad.ac.uk/colak19nov.pdf. SIDC-Team: 2003, The international sunspot number. Monthly Report on the International Sunspot Number, Online Catalogue. http://www.sidc.be/sunspot-data/dailyssn.php.